When I first started studying wine seriously, the country that intimidated me the most was Italy. Other countries, like France, made sense to me. All you needed to do was learn the strict rules of each region and you’re set. Italy is different. In Italy each region has its own set of rules and guidelines. Not to mention there are hundreds of indigenous grape varieties in Italy, how can one begin to understand them all? It can be overwhelming. I’ve learned the only way to tackle learning about this country is one region at a time. By starting small. I’ve also been very lucky to have had the chance to visit several regions in Italy in the last couple years, which has given me a level of understanding of these regions I couldn’t have imagined prior to these experiences. Traveling to any wine region is really the best way to learn about the wines — ideally directly from the people who make them. But that is not possible for many wine lovers. My advice for anyone wanting to delve deeper into Italian wines is to pick one region at a time, and begin exploring. If you are used to drinking Pinot Grigio, branch out to Pinot Bianco, Gavi, or Soave. Attend tastings focused on specific Italian wines. Find a wine shop that specializes in Italian wines and talk to the owner about his or her favorites. Read. Most importantly, get out, explore, and experiment. If you want a very basic foundation on Italian wine laws (which can be confusing), and an introduction to two regions (Umbria and Campania) click here. If you follow Vindulge in the next few weeks I’ll be tackling the wines of Friuli–Venezia Giulia (Friuli for short), having just returned from a week there. Not only did I learn about Ribolla Gialla, Friulano, Ramandolo (among several others), but also the ridiculously amazing prosciutto and cheeses produced there. 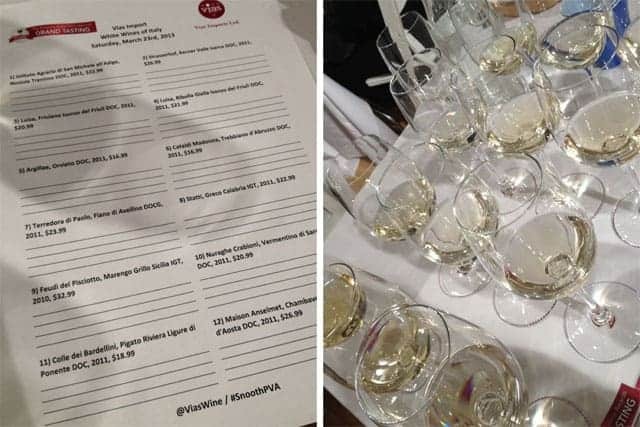 Immediately upon my return from Friuli I had the chance to attend a seminar in NYC of white wines of Italy, thanks to Snooth and Vias Imports. 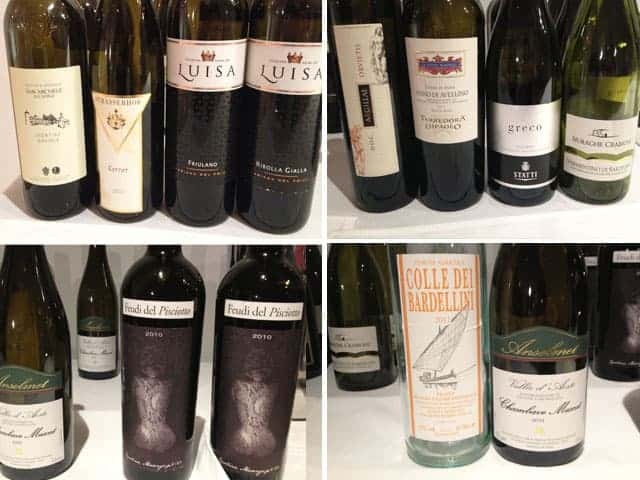 It was a great introduction to Italian white wines and any of these would be a great place to begin exploring the wide world of Italian wines. I was thrilled to get to taste some wines from this region — known for fantastically crisp and delicious white wines. Historically this grape was called Tocai Friulano but now goes by just Friulano. These wines can be delicate, light, and fresh with focused minerality. The producer, Luisa, is a family owned operation (like many in the region), founded in 1929 and currently has 185 hectares of grapes planted. This wine was a lighter style Friulano with melon aromas, a minerally mouthfeel, bright and refreshing on the palate with lingering acidity on the finish. From the same producer and region, we also tasted Luisa’s Ribolla Gialla. I tasted many Ribolla Giallas on my trip and it has to be among my favorite varieties from this region. Most producers make still wines from this grape variety, but many are also experimenting with making sparkling Ribolla. That, in my opinion, is where Ribolla really shines! If you have the chance to find some sparkling I highly recommend it. In the meantime, this Luisa had a very fragrant, fresh, and earthy nose, was rich and slightly heavy on the palate with lots of mineral undertones. A nice example of this complex grape variety. Orvieto was one of my favorite discoveries last year on my trip to Umbria, including buying this particular wine by the case I found locally here in Connecticut. These are among the most well known and popular white wines in all of Italy, and also account for ¾ of wine produced in Umbria. Crisp bright wines produced in the town with the same name, they are made from blends of the following grapes: Trebbiano, Grechetto, along with Verdello, Drupeggio, and Malvasia. There is also red wine made in Orvieto from Cabernet Sauvignon, Merlot, Sangiovese, but it is most famous for its whites. The Argillae Orvieto was bright, citrusy, and fresh with lemon and lemon peel on the nose, bright and lively on the palate with some fresh pineapple. Made from Trebbiano, Grechetto, Chardonnay, Malvasia di Candia and Sauvignon this was a nice, bright, fresh example of Orvieto. I am big fan of Terredora di Paolo because they tend to produce great representations of the wines from Campania, and they are also widely available throughout the US (making them accessible to those outside of major cities). The Fiano di Avellino (made from Fiano grapes) had a bright and fragrant nose of apricot, blood orange, rich minerality and a noted saltiness, with a complex and mineraly mouth. It was elegant and structured on the palate without being weighty. A very interesting wine. If you want to branch out to something less pricey, but in the same region, I recommend Terredora’s Falanghina, a favorite of mine and reasonably priced at around $14. We also explored wines from Trentino Alto Adige in the north of Italy, Sicilia to the south and Sardegna (an island of its own off the western coast of Italy’s boot), among many others. To learn about the wines I didn’t mention from the tasting, and more about the ones I did, I encourage you to check out what other attendees of this tasting say. They have some great perspectives on the same event. Italian white wines are so varied from region to region, but the best display great fragrance, acidity, and minerality. I love the wide variety of whites from Italy – there’s so much to explore. Again, my best advice to learn about the wines of Italy, just get out and explore them — one region at a time! If you’d like to learn more about Friuli specifically, subscribe to Vindulge and have new posts delivered directly to your inbox. The next few weeks will have several more posts about this beautiful region and its delicious wines. For a preview of the Friuli–Venezia Giulia region click here.